There are times when I just don't feel like cooking, but I want dinner. I'm sure it happens to everyone. At those times I want something that takes a minimum of fuss but packs a flavor punch. Something that doesn't take too much time and leaves little mess to clean up. Something that won't interfere with a busy night spent on the couch catching up with my shows. 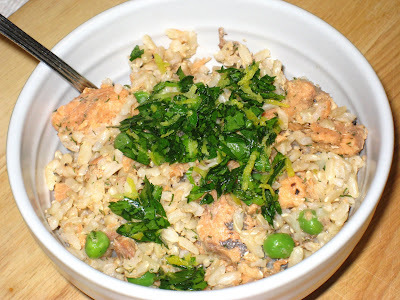 I don't remember exactly when I first tossed a can of salmon into brown rice, but it was super easy and tasted good just with the salmon and rice. Over the years I have refined it bit by bit - first I started adding dill to the rice, then peas. This time I added one of my more recent discoveries, gremolata, which pushed it completely over the top. More on that later. It does take 45 minutes to cook the rice, but you don't have to be in the kitchen the whole time. I usually put the rice on, go relax for half an hour, and then prepare the salmon and the garnish. Rinse rice and place in a 3-quart saucepan with the water. Bring to a roiling boil; let boil for a minute. Cover and turn heat as low as it will go. Cook for 45 minutes. Do not lift the lid while the rice is cooking. After the 45 minutes, lift the lid just long enough to throw the frozen peas into the pan with the rice; cover and let stand for 5 minutes. About 15 minutes before the rice is done, remove the salmon from the can and place it in a large mixing bowl. You do not have to remove the bones from the salmon, but you can if you don't want them in there. I usually remove the large backbone, but the smaller bones are too much trouble and I can't tell they're there so I usually don't bother. Once the rice and peas are finished, add them to the bowl with the salmon. Add the dill, olive oil, lemon juice, garlic powder, salt and pepper and mix well. Serve garnished with chopped parsley or gremolata. http://foodmarketnews.blogspot.com and I would appreciate if you could kindly have a look at my blog too. It's updated on a daily basis.